Successfully Added Full HD 3D DLP Projector - Android OS, Bluetooth 4.0, Wi-Fi, HDMI, VGA, 3D Support, 3D Glasses, Airplay, Miracast, DLNA to your Shopping Cart. Make your home movie-night friendly with the Full HD DLP Projector with 3D support. The compact, lightweight projector won’t take up too much space and is super easy to carry around. With 3D support, 1080 resolution, Wi-Fi and more, the DLP projector is a great media gadget for both home and office. With the full HD 3D projector, your home entertainment system will get an enormous upgrade – and you won’t have to install fancy equipment that takes up half your living room. This HD projector with its 1080P support will offer you great viewing quality and is great for watching movies, videos, playing games and more. You will have Android 4.4 operating system – and thus, a great interface and smooth navigation. You will be able to access the Play Store for apps and games as well. With HDMI, VGA, Bluetooth 4.0 and Wi-Fi, the projector sports great connectivity to other devices. 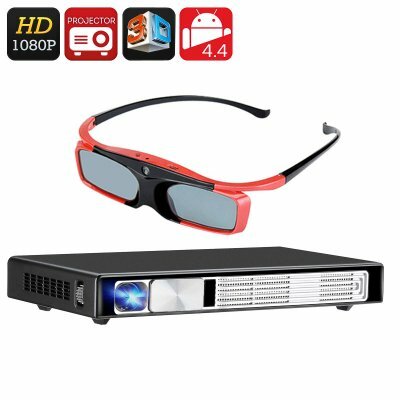 One of the major highlights of the projector is 3D support – it even comes with 3D glasses for the ultimate experience. The projector also features surround sound support – and you will be able to set up an in-house movie theatre on a budget. So load up on fun 3D content, invite your friends over and enjoy! The HD DLP projector comes with DLNA, Airplay and Miracast support. With 300 Lumens brightness, you will have a clear picture at any time of day. With Mstar628 Quad CORTEX A9 CPU and MALI450-MP1 GPU, the projector is set up for smooth operation and lag-free gaming. You will have 8GB of internal memory + 32GB on an SD card. The 10000mAh built-in battery gives you plenty of juice – (you can use the projector non-stop for up to three hours) and it has a quick recharging time. The HD 3D DLP projector comes with a nice compact design, a handy sliding lens cap and will fit in nicely into any interior at home or office. It won’t attract attention, take up too much space – and yet offer you lot of great features. The HD 3D DLP Projector comes with a 12 months warranty, brought to you by the leader in electronic devices as well as wholesale Android projectors..